FDT-21W ultrasonic flowmeter is designed to measure the fluid velocity of liquid in a full/closed pipe. It is a measurement system which is both easy to install and use. 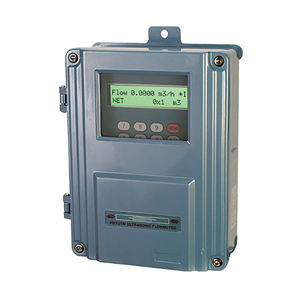 The FDT-21W operates according to the difference in the transit time of flight measured, and determines the flow velocity by measuring the travel time of a pulse from one transducer to the next. Flow in the same direction takes less time to travel to the second transducer than does flow in the opposite direction. Electroacoustic transducers receive and emit brief ultrasonic pulses through the liquid of the pipe. Transducers are vertically placed at both sides of the measured pipe. Sensors are placed on the pipe and fastened by means of a clamp. The display will quickly show the flow velocity. The FDT-21W can be used for metallic, plastic and rubber tubes. 참고: Comes complete with standard size high-temperature transducers (S2H), M2 memory storage card, two 5 meter transducer cables, transducer clamps (DN100), Allen (hex) wrench, 10 terminal spade lugs, shrink tubing, acoustic gel, and operator’s manual.